An increasing number of facilities meet the stringent requirements. There are currently 208 laboratories that have been accredited by SATRA. In order to achieve this distinction, the facilities have to undergo a rigorous auditing process, based on the ability to test to specific methods and standards. An in-house laboratory must be well controlled with clearly defined responsibilities. Its quality system, equipment, environment and members of staff need to prove to be of a very high standard. Regular SATRA audits ensure an ongoing commitment. 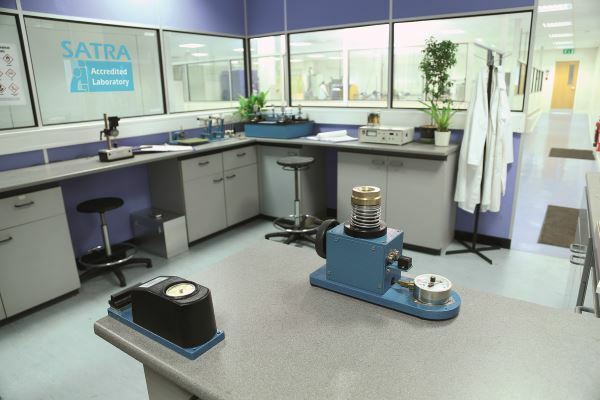 The SATRA Accredited Laboratory programme is recognised throughout the global footwear and leathergoods industries as an authoritative stamp of quality between business partners. It is effective throughout the supply chain all the way down to retailers and consumers. For instance, manufacturers and material suppliers benefit from being able to present meaningful and accurate test data. Resourcing companies benefit from a more reliable evaluation of products and general improvement in quality and fitness-for-purpose. Displaying a SATRA Accredited Laboratory certificate has proved to be a major selling point in helping to attract and retain customer orders. SATRA’s experts regularly travel to member companies to provide training in testing. The only requirement is that the necessary test equipment is available on-site. Where this is not the case, we can deliver training at SATRA’s UK headquarters, or at our facilities in Dongguan, China. We can provide interpreters if required, and trainees are expected to carry out tests under supervision. SATRA also provides assessment services to finalise training and to ensure its effectiveness. Our training extends to interpretation of test results and, in many cases, guidance on identifying corrective action to improve poor performance. Please email quality.services@satra.com for further information on SATRA laboratory accreditation and training. This article was originally published on page 44 of the April 2019 issue of SATRA Bulletin.